The other night I felt like taking risks. I chose Valentine’s day dinner to debut a new dish! Quite a gutsy thing to do if you ask me. I could have gone with a trusty standard but I wanted to be bold. The stakes were high, it could have ended up in disaster but instead it resulted in a deliciously spicy dish! I made Chicken Enchiladas with Spicy Chocolate Mole Sauce! 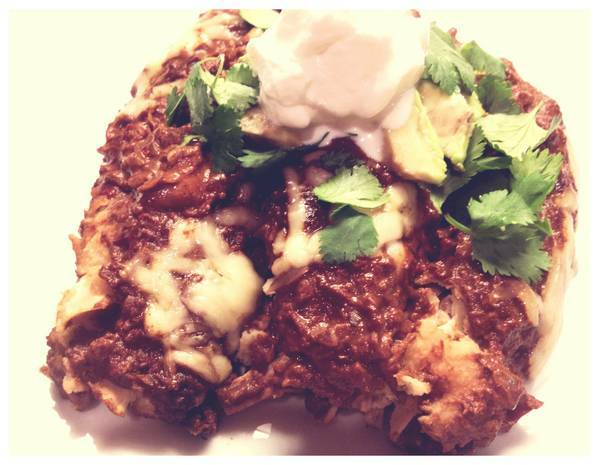 This was my first attempt at taking on this yummy Mexican classic and it was a hit! When researching numerous mole recipes the amount of time, ingredients, and effort varied wildly. My goal in coming up with my own recipe was to make a dish that was restaurant quality (or be even better 🙂 ) and to not tie me to the kitchen for an unreasonable amount of time, because after all it was Valentine’s day. I achieved both of the goals in the recipe I came up with. YAY! Soak in dried Ancho Chili peppers in hot water for 30 minutes, then cut stem off and take seeds out. Prepare 9 by 9 inch baking dish with non-stick cooking spray. Add vegetable oil to large saute pan over medium heat, add onions and cook for 2-5 minutes. Add garlic, ancho peppers, cumin, cinnamon, chili powder, cocoa powder and chocolate to pan, cook for 2-5 minutes. Add tomatoes, chicken stock, peanut butter and almond extract, allow to cook for 5 minutes. Pour mixture into food processor or blender and blend until smooth. Take corn tortilla and fill in the center 1/3 of the tortilla chicken, cheese, and a dollop of mole sauce. Roll tortilla and place it in baking dish, seam-side down. Repeat until all tortillas are used. I love me some Mole! Thanks for the recipe. Perfect food for the RankedZilla launch party.